It’s sort of remarkable to think about Zootopia. In the context of itself the film is not remarkable, except that it is a very good movie, confirmed by its formerly 100% rating on Rotten Tomatoes (now 99%), and the $73.7 million it made at the box office this weekend. Rather, what’s remarkable is to compare it to Disney’s huge successes of the past. The beloved hits of the ‘80s and ‘90s—from The Little Mermaid to The Lion King—continue to shape our generation as evidenced through endless Disney Princess content, and were certainly stunning feats of animation, with tightly written songs and lots of serviceable jokes. But few carried much of a message, and if they did—as has been noted time and time again—they weren’t particularly inspiring or thoughtful, especially for young women. The standards, pushed by Disney’s acquisition of competitor Pixar, are higher now, and Zootopia is the much welcomed fruit of that labor. Frozen quite obviously takes the cake as Disney’s most successful animated film of maybe any decade ever, but even Tangled indicated that they were being more creative, and their evolution was something to look forward to. It’s fitting, then, that an audience demanding stories with female leads that weren’t about princesses would get a movie like Zootopia. It follows the story of Judy Hopps (Ginnifer Goodwin), a bunny who lives in a small town called Bunnyburrow but dreams of becoming a cop in the big city of Zootopia, even though—in a world of predators and prey, where the predators fill powerful jobs—the police department has never had a bunny cop before. The symbolism is quite overt: upon her arrival at ZPD through a diversity initiative, Judy finds herself relegated to parking duty by the ornery Chief of Police, Chief Bogo (Idris Elba). “Sir, I’m not just some token bunny,” she says to deaf ears. In many ways, Judy is as upbeat and ready for anything as Inside Out’s lead Joy, but she’s still got an edge to her. 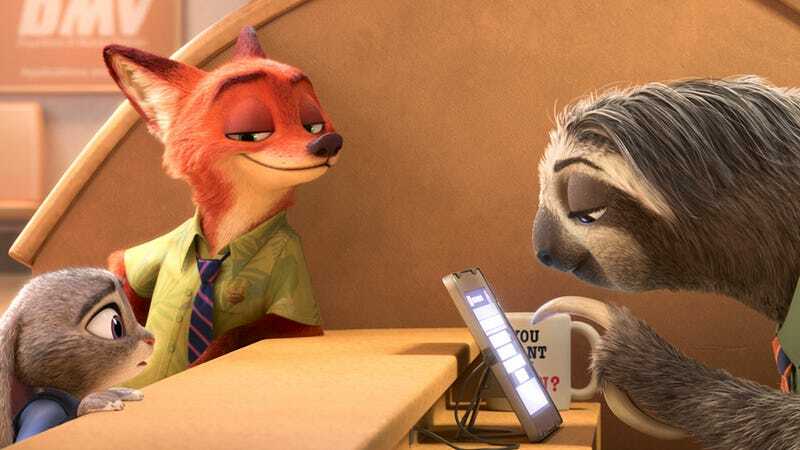 She’s ready to tear up her nemesis-turned-ally Nick Wilde (Jason Bateman), a fox who is definitely shifty, but provides Judy with important advice from his own struggles: “Never let them see that they get to you.” (As io9 reported, another thing that explains the success of the film—and is fitting to its message—is the filmmakers realizing that Judy was the lead of the story, and not Nick.) Judy has a backstory with foxes: we see one beating her up at a young age, and at first, Nick seems to fit right into her notions of what predators are like. Like Inside Out, what’s particularly impressive about the film is how informative it is about the dangers of prejudice without being preachy or cheesy. It demonstrates how those who are discriminated against can push the preconceptions people have about them back on others, creating a cycle that is difficult to break—how oppressed people can very easily lash out and oppress others. Zootopia doesn’t hold its audience by the hand either; we’re swiftly plunged right into this world and must immediately catch up. There’s no history lesson about the past, only references to a time before, when predator and prey didn’t live together in harmony because predators were “savage.” Perhaps that’s because we don’t need to be caught up: this is one big analogy for the human experience, after all. As we hope for in an animated film, the Zootopia world is stunning array of animals large and small, with a beautiful range of sceneries that are mesmerizing to watch. But most striking is the way this movie neither talks down to children nor up to adults. It doesn’t sugarcoat how difficult it is to change our ideas of others, but it does suggest how patently stupid many of those ideas are. Zootopia might be a testament to how seriously we treat children now, but if the result is that we’re making movies that start conversations for them and for ourselves, that’s an incredibly heartening development.